Neru: OK, this article is going to be all about me! And about me, ONLY! And that was because the last article was written about her; so why is she here? Miku: Because you love me? Neru: NO I HATE YOU! YOU HAVE NO IDEA HOW MUCH I HATE YOU! This article as Neru clearly stated above is all about Akita Neru. We’re going to bust some myths and misconceptions about her. We will also discuss what makes her almost virtually unique in the Vocaloid fandom and also why she’s actually important. We will also discuss why she may be disappearing; and this is a fact, not fiction. Akita Neru as an Internet social phenomenon is perhaps historically significant. She is probably unique; definitely the first of her kind but also probably the most controversial and misunderstood. Especially by her fans outside of Japan. Miku: Waaaaahh… Neru’s being mean to me again! Anyway, let us begin with when this all began: October of 2007; not long after Miku gained prominence in otaku and anime interest circles in Japan. What basically happened was that due to a technical hitch, “Miku Hatsune” could not be retrieved in Google and Yahoo search results. This lead to the belief among her fan base that the Japanese music industry was trying to eliminate Miku entirely: the “Anti-Miku Campaign” was the term they coined for the “incident”. As events evolved, there were a lot of anti-music industry threads and discussions on Japan’s 2chan forums. What was disconcerting about these threads was that very quickly, strange posts started to appear with inane and deflective comments. To the denizens of 2chan, this was believed to be an attempt by music industry trolls (specifically: sockpuppets) to kill the anti-Miku discussions. Miku: Ah-ha; I knew it! Neru is a troll! Actually technically, she isn’t; and this is one of the biggest misconceptions about her. 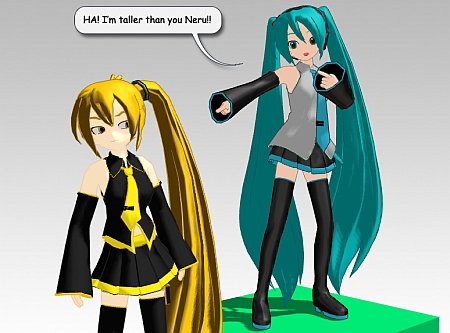 Neru: I told you so Miku! Miku: She’s not a troll? Neru: Is there any part of me that looks like a troll, Miku? Neru: DON’T YOU DARE FINISH THAT SENTENCE MIKU! Some of the more technically savvy members of the 2chan forums did some investigations into these troll threads and discovered that one of the IP addresses used by a troll belonged was a proxy address assigned to a cell phone; furthermore the address fell within a range of addresses that was assigned to a specific Japanese online promotions company. Once these investigations were published, 2chan moderators closed the affected threads and at about the same time, the Google and Yahoo search results difficulties were resolved. So the “crisis” was abated, however, one of 2chan’s forum members, Smith Hioka, decided to summarize the whole incident by creating an anthropomorphic caricature of those forum trolls that were associated with the incident in the form of an anime girl design that he named: Akita Neru. Miku: >< … too many long words. Miku: But doesn’t “anthropomorphic caricature of those forum trolls” mean that Neru is a troll? That’s what everybody believes! Neru: That’s because they’re all bakas… especially YOU, Miku! What Akita Neru is, is actually a political caricature in the best tradition of political caricatures; although, admittedly she was made to poke fun at the 2chan trolls and has always been associated with them; even by her own creator. Her design is extremely clever. It is loaded with innuendoes. Miku: I knew it! She’s totally a dumb “blonde”! Miku: *squinting* “‘yellow’ as her colors and these are reflected in the color of her trims, hair and eyes…”…? I don’t get it? Neru: And what color hair and eyes do you have, baka? Miku: Well, everyone knows that I have teal colored hair and eyes! Neru: Figure it out for yourself. Miku: So why is this even important? It is important because of all the nonsense between anime cos-players, where Asians and non-Asians argue about the ethnicity of anime characters being portrayed. Neru: Try and wrap this around your head Miku – what ethnicity does a stick figure have? Miku: Oh, that’s easy! Everyone knows a stick figure has no ethnicity! Neru: Now do you get it? Neru: Here’s a clue, baka: What color are our eyes again? In Akita Neru’s case, most likely she falls into category “2.” in the list given above. This is consistent with her original meme as stated by her creator. Miku: Well, at least I’m a “VOCALOID”, but you’re just a “BOUKALOID”! In Japanese, ‘Vocaloid’ and ‘Boukaloid’ is pronounced similarly; the latter is a pun. Neru is a “Boukaloid” (fake vocaloid) which is a term that can be applied to any fan created vocaloid character. Where, Akita Neru is unusual is that she is the first boukaloid to become a true commercial entity. Legally, Akita Neru belongs to Smith Hioka. But she is a derivative of Miku Hatsune which belongs to Crypton Future Media, Inc. What this means is that neither party can derive revenue from Akita Neru unless there is some legal agreement; and this is exactly what happened with Akita Neru. 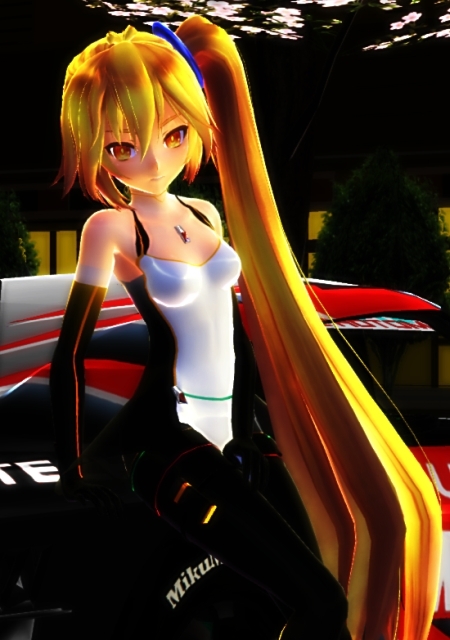 She is licensed to Crypton by Smith Hioka for the purposes of merchandising rights (only). This is why she can even appear in SEGA Project Diva games. However, unlike Miku Hatsune, who is a vocaloid, Akita Neru has no “voice”. Instead she is voiced using the same vocaloid software as Miku; just at a lower octave. In the SEGA version of Neru, she uses a higher octave. Because she looks similar to Miku, and shares her same voice bank, this allowed her to be creatively used as a vocaloid and she has featured in thousands of videos hosted on NicoNico and YouTube singing songs specifically written for her and sung by her. She has developed a fan-base of her own and perhaps a rather unique one; which we will cover in more detail below, because a small part of her fan-base may be what is killing her off. As with Miku Hatsune, much of her character is built upon by her fan-base and in rather particular ways too. So for example, many anime girl character have an associated totem item. In Miku Hatsune’s case this is the “leek”. These were forever linked to her when she was first illustrated with leeks while performing her hit single: “Polka Levan”. Smith Hioka gave Neru a cell phone as her totem item, but some of her Japanese fans also gave her a katana (to emphasize their contention that she is Japanese). So unusually she has two totem items associated with her. But strangely, she’s never been associated with a favorite food. Miku: Put that thing down! Miku: HEY THAT COULD HAVE HIT ME! She was also attributed with a “tsundere” character trait by Smith Hioka and this was also built upon by her fans. Basically, a tsundere character is one who on the surface has a very abrasive personality but underneath there is a much more loving personality which is carefully hidden except, usually, with a love interest. A lot of people think that this type of character trait as a literary device is uniquely Japanese and associated with the anime culture. Tsundere type characters have a centuries long history and not just in Japan. One of the earliest known character of this type was Katherine from the Taming of the Shrew by William Shakespeare. Miku: You love me right? Neru: ME … ‘love’ … YOU? NEVER!! Miku: *Hugging Neru tightly* Admit it you love me! Miku: *Hugging Neru even more* So you do love me after all! So as a fan created character, Akita Neru, has established quite a niche for herself. She has animations made of her, MMD models made of her, songs written for her and an adoring fan base. Her future looks rosy doesn’t it? Take a look at these graphs which gives us probably our only quantitative source of data of what is really happening with Akita Neru. These are the aggregate measurements of the amount of interest on Akita Neru as measured in the number of times people uses her name as a search term (as measured by Google). Be careful how you interpret the data; especially with Miku. Miku’s graph is fairly flat lined and that is consistent with an established product line. People know about her, she has a loyal fan base plus corporate assets to keep her presence in the marketplace stable. She still has a lot of material made for her plus she’s transitioning well into new technologies. Miku Hatsune as a product line still has plenty of “shelf life“. Akita Neru, doesn’t have her own voice bank. Like Miku, she also has a lot of non-Japanese fans; but in a manner that is possibly crucial to her long term viability. However, notice that her graph curve has a gradual and continuous downward trend. The data is suggesting that she is losing market visibility; but why? There are several reasons. First of all, she doesn’t have the corporate support that Miku Hatsune enjoys. But this is not a big factor outside of Japan; her Japanese fan interest level is still fairly steady as can be inferred from the searches using her Japanese name as a search term. So why is interest in her falling so rapidly in the Overseas market? Especially in the US market which the Chart by Region seems to suggest as being the most important? For Akita Neru to survive outside of Japan, she needs content about her to be constantly created by her fan base outside of Japan. The most important places for these to happen are venues like Deviantart and YouTube. So, if this is true, this suggests that not much content is being made for Akita Neru. There is a good probable reason for this: fan girls. Now what I write next is going to be controversial and it is I emphasize; only a hypothesis. I am putting this idea out there only for the purposes for discussion. It is also going to be probably Politically Incorrect. So if you are easily upset or offended by unpleasant lines of thinking, stop reading here! Miku: He used another long word: “hypothesis”… what does that mean? Miku: Yeah, he’s been using some really difficult words in this whole discussion. Neru: Yeah, because he’s trying to eliminate bakas like you as well as the TL;DR crowd. Miku: Oh I get it! So the important part comes next! Akita Neru outside of Japan is often perceived as being a blonde because of the coloring of her hair. Nothing unusual here; Naruto Shippuden is sometimes perceived by his fans in the same way despite the fact that he is supposed to be Japanese. There is no harm, here. Anime characters are inherently ethnically ambiguous to begin with. Very often, anime using yellow haired characters will categorically indicate whether they are “foreigners” or not simply by specifically stating the case; usually through the name of the character. With Akita Neru this process is different because she is defined by her fans. So if some Overseas MMDers want to characterize her as being a “blonde”, this is all fair game. What this also means is, however, that some non-Japanese (regardless of ethnicity) can readily identify with her as being representative of themselves. However, to complicate things further, she’s also the underdog when compared to Miku. She is the “Miku-wannabe”. Miku: “Miku-wannabe”… hehe, I get that one! Neru: I’m really going to hurt you now…. As a part of this formula, the Disney princesses have a big influence in a girl’s growing process. How often are girls encouraged into the thinking that they are princesses and that one day their Prince Charming will come along, sweep them off their feet, marry them and then they live “happily ever after”? But Akita Neru is different. She is a princess who never becomes the princess. On top of that, she’s a rebel; she’s independent; she’s aggressive, but with a soft side. She’s also the “outsider”; the boukaloid that wants to be a vocaloid but could never be one. She’s not happy; Akita Neru is often portrayed as being unhappy. Neru is often portrayed in a dysfunctional relationship with Len Kagamine. Her friend and “rival”, Miku Hatsune, seems to have all the breaks. But at least Neru is struggling through all these things. She’s poor, but through her strength of character, overcomes all odds and achieves some degree of “happiness”. Akita Neru is a “survivor”. Her “tsun” characteristics gives her a shield that protects her softer “dere” side from the cold, harsh realities of an increasingly complex and bewildering world. Akita Neru is the perfect role model for a wounded soul. In Akita Neru’s worldview, she is a winner because she makes her own rules. She has the inner strength to do this. A strength that her admiring fan girl might not have. People don’t understand her. They’re not interested in her. They don’t care what she has to say, or even want to share her thoughts. If you marry the standard Akita Neru meme with the psychology of a dysfunctional teenage fan girl; what in essence you will have is a psychotic time bomb. So what do you think will happen when other kids or MMD content creators begin to build upon the Akita Neru meme and begin to introduce concepts that falls outside of the “comfort zone” of the mindset of one of these type of fan girls? Exactly what happens, has happened within the Deviantart community a lot: the drama, the cyber bullying, the disruptive behavior. But there is another side to this. If kids are attacked for portraying Neru in innovative ways (a natural part of their creative process) the likelihood of them using Neru again in another creative work is at best “very unlikely”. So ironically, by trying to protect their “alter ego”; what the overly protective fan girls are actually doing is killing Neru. Akita Neru is kept alive by the constant creative use of her; if no one uses her; she’s going to be forgotten. Akita Neru is 100% “crowd sourced”. How many people remember the vocaloids, Ann, Leon and Lola? Or for that matter, even knew that they once existed? If there is only one person in Akita Neru’s room; ironically, it’s going to be a very lonely room. So inadvertently, by trying to “protect” Akita Neru; our dysfunctional fan girls are actually killing her. Neru: Will you quit that, already! You’re getting my clothes all wet! Neru: No he didn’t; I’m doing fine in Japan. Neru is actually doing fine in Japan. This is because in Japan her fan base is allowing her character to grow. This helps to maintain her presence in the Vocaloid world; it is a quiet but steady process; she’s portrayed with less emphasis on the “tsun” and more on the “dere”. Slowly she’s evolving into simply a Japanese anime “girl next door” type who just happens to have yellow hair. Miku: Eh… if you do die; can I have your cell phone? I cracked the screen on mine. Miku: *squint* Does it bother you? Miku: In that case, how about a ghost story? Akita Neru © Smith Hioka, Crypton Future Media, Inc.